KIAWAH ISLAND, S.C. — Sunday at 94th PGA Championship didn't have the feeling of the coronation at the U.S. Open or the Honda Classic win that sent Rory McIlroy to the top spot in the world for the first time in his career. The final round at Kiawah Island felt different. Despite the fact that he won by a record eight shots -- eclipsing Jack Nicklaus' seven-shot win at the PGA in 1980 -- there was no pomp and circumstance as the 23-year-old demolished the field with a clinical 6-under 66 round -- he finished the week at 13-under -- to win his second major championship in the last two years, becoming the youngest player in golf history to do so. "It was a great round of golf. I'm speechless," McIlroy said. "It's just been incredible. I had a good feeling about it at the start. I never imagined to do this." 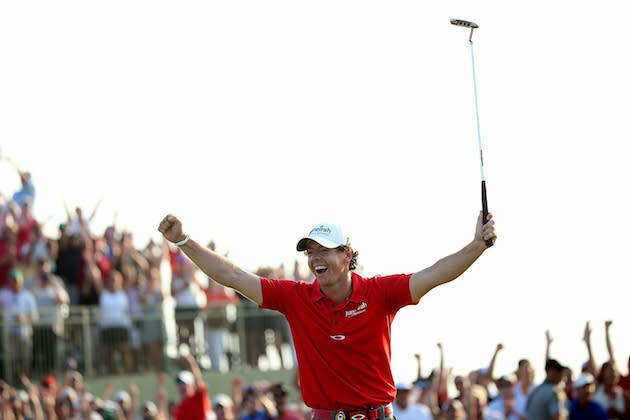 If anything, McIlroy's second major win felt normal, even expected. Ever since he burst onto the scene as a baby-faced 17-year-old at the Masters and took home low amateur honors, people have been expecting greatness from the kid with the curly hair and boyish good looks. He lived up to the expectations with his historic eight-shot win at the 2011 U.S. Open, but like all great players, he was always expected to improve -- to raise his game to another level like others before him. One happened to be in the field this week at the PGA Championship wearing a red shirt just like the one McIlroy was sporting when he strode to the first tee for the final round. Like the other guy in red, McIlroy put on a major championship clinic during the final round, the kind we used to see from Tiger Woods during the prime of his career. From his opening tee shot at 1:45 p.m., McIlroy never flinched, firing at pins and pouring in putts the entire day. And when Ian Poulter opened with six birdies in his first seven holes, McIlroy countered like a prize fighter, posting three birdies on the front nine to maintain his lead before landing a huge body blow with an up-and-down from the sand on the 10th hole to keep the lead at three shots. "You know, I'm looking at the leader board thinking I must be chasing him down, but I never did," Poulter said. "Rory is obviously playing some immense golf. Everybody should take note: the guy is pretty good." Then came the knockout punch, as McIlroy added three more birdies on the back nine, stretching the lead to eight before it was all said and done. And what of Poulter? He was a McIlroy casualty -- just like everyone else in the field who seemed to fade as the Ulsterman put his foot on the throat of his competition and shattered their dreams with a final round that made you believe the kid from Northern Ireland isn't a one-major wonder. No, we're looking at the best golfer in the world. McIlroy, who moved to the top spot in the Official World Golf Ranking with his win, went from king-in-waiting to the new king of golf on Sunday. It would be a huge deal, but the thing is, this is what we always expected from him. "He's going to be the player that kids look up to, that kids measure their own wannabe games by," Graeme McDowell said. "Ten years ago it was Tiger Woods. It still is Tiger Woods to a certain extent, but now we've got superstars like Rory McIlroy that kids will be looking at." The PGA Championship may be known as "Glory's Last Shot," but for Rory McIlroy, the final major of 2012 was just the beginning of what looks to be a historic career. As McIlroy will soon find out, it's good to be the king.